The European Values Study is part of the SERISS project (Synergies for Europe’s Research Infra-structures in the Social Sciences). 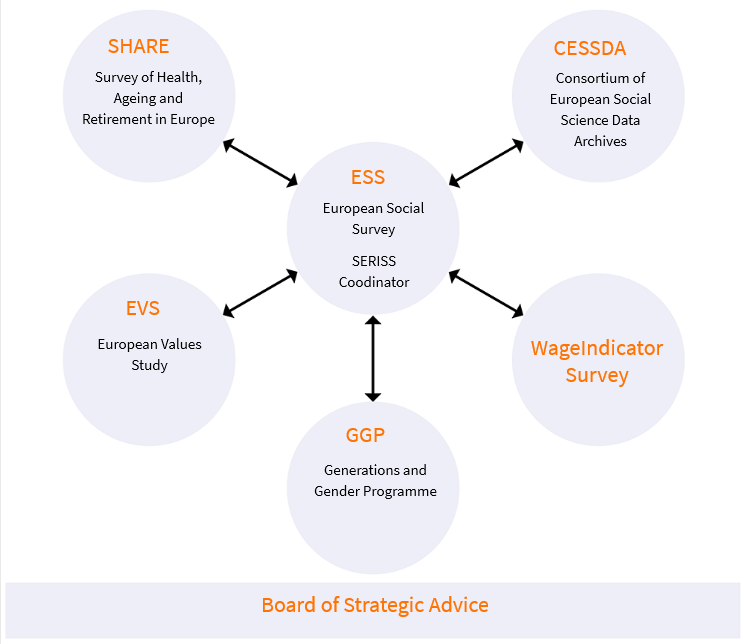 SERISS is a four-year project (2016-2019) that aims to strengthen and harmonize social science research across Europe and involves the participation of five other research infra-structures (ESS-ERIC (Coord. ), SHARE-ERIC, CESSDA, GGP and Wageindicator Survey). As part of the SERISS project, EVS is involved in the development of research infrastructure for large-scale surveys. One component with higher potential impact for the current data collection of EVS 2017 resides in developing web panel design using probability samples. This component helps in improving the web surveys’ methodology by combining the advantages provided by the data collection via web surveys with higher quality standards already established for other modes of data collection. To develop a blueprint for a comparative probability-based web survey. All the deliverables from the SERISS project can be downloaded here. Through active participation in the SERISS project, EVS was able to deploy and test various newer tools in the survey, as well as assist in the development of tools. The use of the Translation Management Tool (TMT) has facilitated the coordination of the translation process among the national teams, facilitated monitoring by a central team, and supported the documentation of each phase of the questionnaire translation. The education classification was compiled in close cooperation with the European Social Survey (ESS) and its experts, in particular with Silke Scheider and Verena Ortmanns from GESIS Mannheim. This made it possible to apply a coding scheme for the harmonization of educational attainment (edulvlb) developed especially for use in social science research. Using the CharmStats tool developed by GESIS, which supports the process of variable harmonization, a user-friendly variable documentation has been developed that makes the country-specific harmonization process transparent for selected variables such as religious affiliation, education, political parties (left / right). Finally, the EVS is piloting the development of a collaborative survey program (SMAP) collaboration platform that works with regionally distributed networks. Since autumn 2017, the myEVS portal has been the only and central place for the communication and collaboration of the national and central teams conducting the survey. It helps them to define and comply with workflows and standards, and creates a pleasant environment for organizing their daily work.